Last night we went to support group. At first, I thought I wouldn’t like going. But in February we attended our first meeting and we listened to everyone’s stories. Each story hurt our hearts, just as our own story hurt. But being in that room with people who truly understand how we feel was good for us. I cried as I shared the story of you. Your daddy cried too. Even so, we went back. Last night we went for our 4th time. Now, there are familiar faces each week, friends even. People know our names and they know your name, Joanna. They know our joys and our sorrows and they know how special you are to us. They get it. A few new people came last night. We heard new perspectives and new insights. New stories with fresh wounds. Older stories, still raw a year, 2 years, or more, later. Joanna, I want to tell you about something that really resonated with me. I have been thinking about the future, about how it will feel to be pregnant again, how I will feel. I don’t mean the will-I-have-morning-sickness feeling…I mean the “me” feeling. Will I be scared? Anxious? All of the above? Yes, that’s likely. Your daddy and I have considered what we will do – announce the pregnancy with just as much enthusiasm at 13 weeks as with you? Or wait a little longer, 20 weeks or more, to share the news with the hopes that the farther along we are the more likely your little brother or sister will arrive safely. Lately, I have been leaning toward earlier, feeling like EVERY baby deserves to be celebrated and loved from the moment the two pink (or blue) lines appear. Every one. Joanna, we may have lost you, but we had so much joy with you. I want that for your siblings. Yet, it’s hard for me to imagine being excited and happy when all I can see in the future is fear and anxiety. This is what stuck out last night. One of the ladies at support group is pregnant with twins after losing her son to placental abruption at full term. She said that you can live in fear, or you can soak in the moments and take all the joy. If something happens during your subsequent pregnancy, what will you have left? Only the fear? Or will you have the joyful moments your child brought to you throughout pregnancy? It meant a lot to hear that, Joanna, because she is living it! She can, during her subsequent pregnancy after loss, find joy. Celebrate. Love. Connect. Be her best. All for those double rainbow babies. It’s one thing to say it and think you can do it – move beyond the fear and into hope and happiness. It’s another story for me to see it happening. To see that truth come to life. I’m so glad to witness, in the flesh, that it’s possible. Possible to cherish and celebrate after loss. Someday, I’m going to get to do that. P.S. 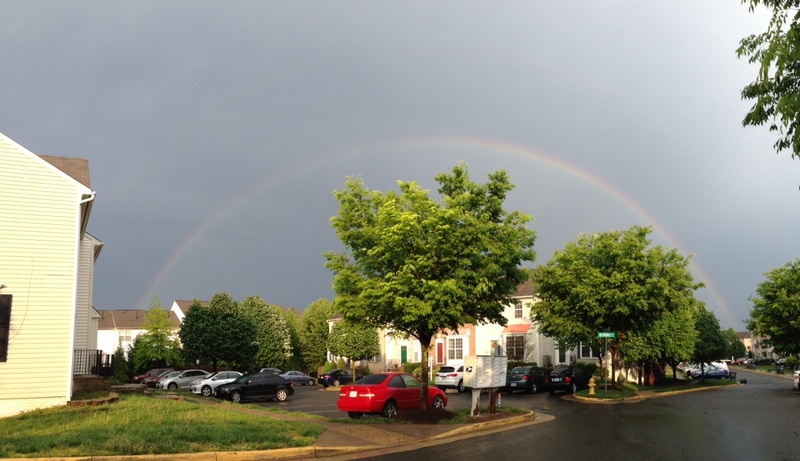 Thanks for the double rainbow at the house the other day. We really enjoyed it! Some words came out of my mouth the other night that I never thought I would say. But they were there, in my mind, weighing down on me. I had to try them out for size. And the moment I uttered them, I burst into tears. I knew, as they rolled off my tongue, that the weren’t true, that they were just doubts and fears that I was allowing to take over. Yet the only way for me to fully realize this was to put them out there. So, on Monday night as Bill and I discussed (more like debated) the possibility of a vacation in September, I struggled to admit what I really wanted to do. Hawaii? Eastern Caribbean? A beach trip close by? Why was the decision so hard to make? Because we were discussing the best option, keeping in mind that I could be pregnant again by that time. Did we want to be away from a doctor? Was getting away from “everything” and being together more important than that “safety zone” that is my obstetrician, perinatologist and cardiologist just a few miles away? There I said it. And in the same instance I knew it was a lie. I want another baby. As soon as possible. On Tuesday I was still struggling with a decision on vacation, but I knew having another baby is in our future. In all honesty, I cried a lot on Tuesday. I cried because I had doubted. I cried because I am scared. I cried because my desire is so strong and I’m nervous pregnancy won’t happen again for us. As I was driving home, I was praying for hope, for faith, for strength for the journey to baby. It was raining, but as I got closer to my exit, the sun popped out in front of me. I was certain there had to be a rainbow behind me. I was positive that I was missing it. As I exited and rolled around the off-ramp, the sun now behind me, I spotted it: the most glorious sign of God’s promises for my life (as well as what I hope was a “hello, Mama!” from Joanna). A rainbow. A double rainbow, in fact. I know I’ve written about rainbows, but I just can’t tell you enough how rainbows bring such joy and hope to me. And this one, I needed it so desperately.